Hands down, this is the most popular add-on we publish. And for good reason. It allows you to run most of you help-desk operations by email. You can respond to tickets, close tickets and even escalate and transfer tickets if you set up the proper rules. For larger operations it supports multiple mailboxes and can allow you to easily separate high-value customer tickets from standard customer tickets. You can even create special support channels for specific purposes such as handling product recalls and special promotions. Power-pack is, by far, the most underrated add-on in our product line. This is because it is a veritable smorgasbord of functions, making it hard to place it into a specific category. It includes functions to make it easy to customize the plugin (changing text for example), impressive security options for multi-agent operations, new notification and collaboration methods and much much more. Locking, splitting and merging tickets along with bulk-updates for certain fields are par for the course with this extension. Ok, we'll admit that this add-on isn't as easy to use as we'd like. While you can immediately get up and running on the core six reports, it does require you to know what questions to ask before you can effectively use its more advanced functions. But once you start asking the questions, its easy to get addicted to using it because it allows you to drill into and slice and dice your data in ways no other help-desk plugin can do. Ok, technically these are TWO add-ons. But in our experience most users get them together. Gravity forms is a powerful form-builder for WordPress and our Gravity Forms bridge allow you to use the data collected from those forms to populate tickets in Awesome Support. This means that you can create just about any support form you like and still store the data in Awesome Support. But, if you are collecting more than the standard ticket data then you'll need some place to store that data - which is where the custom fields add-on comes in. You can take all the custom data you collect in your custom ticket form and store them in custom fields directly on the ticket in Awesome Support. It also means that you can create multiple custom support forms. If you have multiple departments you can create a form for each department. Or, if you have multiple product lines you can create support forms unique to each product line or product model. This add-on is still in beta but, jeepers, its extremely powerful. 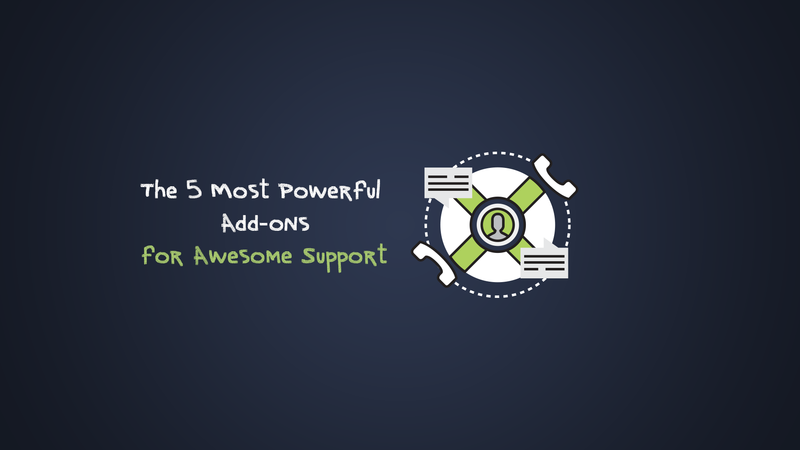 You can use it to automate many aspects of your support-desk operations. And, with Zapier integration you can push data directly to hundreds of other applications. Assign agents based on the content of new tickets. Have a ticket with the word "ford" in it? Automatically assign your "FORD" specialist to the ticket. Having an emerging issue where you're getting many tickets on the same problem? Automatically add a reply to the ticket based on those keyword issues. Automatically add a reply to a ticket based on keywords. For example if you receive a ticket that has the words "email" and "ports" in it you can automatically add a reply to the ticket that links to your email troubleshooting document! Ok, we know the article title said "5" but we couldn't help ourselves - we have to mention this one. It is a niche add-on that targets a particular industry. But if you operate in that industry this is probably the most powerful add-on in our inventory for you. Use it in combination with WooCommerce and WooCommerce Subscriptions to collect payment for your support services. You can collect payment for each ticket as they are opened or you can allow customers to set up periodic subscriptions based on number of tickets or time used.